In an earlier section we discussed the market size for the business idea and arrived at the portion of market which was available to the business, referred to as the SAM or served available market. Due to the competition, the business will only be able to realistically obtain a percentage of the SAM, and this market share is referred to as the serviceable obtainable market or SOM. 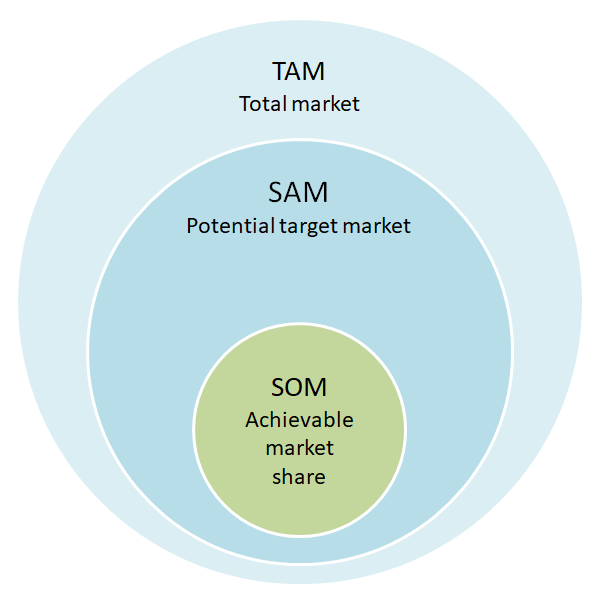 For example, if the served available market (SAM) is 4.5 million and we expect to be able to obtain 1% of this market, then the serviceable obtainable market (SOM) is calculated as follows. The obtainable market share forms the basis of the revenue projection in the business plan financial projection, and it is therefore important that the estimate of the market share is supported and justified by the marketing plan. The SOM is not normally calculated using a bottom up approach, but it is a useful exercise to perform the calculation to see whether the business is able to operate at a level indicated by the estimated market share. For example in the market size section, estimates were obtained for SAM of 4.5 million in year one rising to 7.59 million in year five. Based on available resources (staff, equipment, funding etc. ), the business might estimate that it can deal with 300 customers in year one and 1600 customers in year five. Using an average value per customer of 150, this equates to a revenue of 45,000 in year one and 240,000 in year five or a 1% rising to 3.2% market share. Clearly if the business has estimated a market share much larger than this, it needs to rethink the business plan. The business plan market share section can be presented in the format shown below. In this example, there is an initial brief comment about the market share, explaining its growth prospects and how it can be achieved. Underneath, the market share (SOM) itself is shown in both monetary and % of SAM terms for years one and five. The investor will view the SOM as the short term target for the business and will be looking for this to be achieved without too many problems to show that the business idea has potential. If the business can achieve the SOM then with further investment, it should be able to penetrate the SAM even further. This is part of the financial projections and Contents of a Business Plan Guide, a series of posts on what each section of a simple business plan should include. The next post in this series sets out details of the marketing strategy which the business intends to use to win its share of the market.